The spring fishing season has arrived and you know Alaska is the best place to earn your fish stories. But you don’t want to crowd to the fishing spots where other tourists tangle their lines – no, you want the real experience. Alaska locals might not tell you where to find all the hidden gems, but we have a few hints on where to find these secret fishing spots when you visit Alaska. The most important thing to remember: It’s really hard to go wrong. Alaska.org has assembled a list of more than 500 Alaska Fishing Spots, with Alaska residents visiting and choosing the best of more than 800 fishing spots marked on the Alaska road system. You can download Alaska.org’s affiliated Alaska App that allows you to get insider secrets on things like wildlife viewing and the best fishing spots. Or you can check out these 10 favorite fishing rivers in Alaska – mind you, these are the favorites out of Alaska’s 12,000 rivers. That’s pretty exclusive. One of the things that most travelers don’t know is that fly-fishing in Alaska’s lakes – even those near cities – are one of the best places to get away from the crowds. 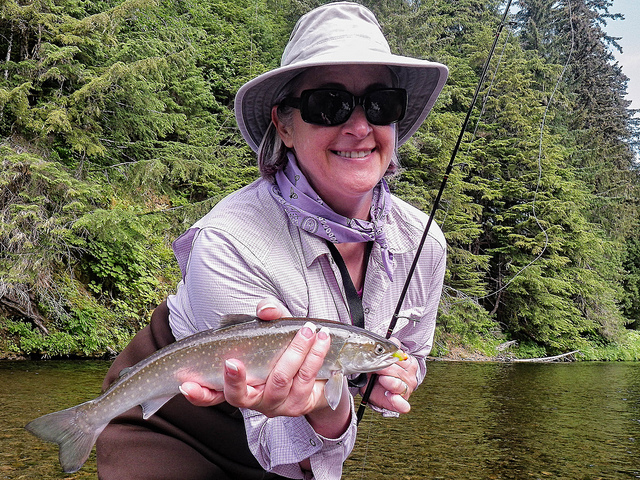 Check insider sites like Alaska Fly Fishing online for recommendations on timing and places to find certain kinds of fish, whether you’re looking for rainbow trout, Dolly Vardens or salmon. Learn more about Alaska’s famous Copper River salmon. Here’s another hint: Sometimes when you go is as important as where you go. The southeast provides a great freshwater and saltwater fishing for year-round opportunities to catch the one that might otherwise have gotten away. Winter ice fishing is big (it would have to be, right?) especially in the interior. The state’s fish stocking program has kept lakes full of rainbow trout. Check out the scoop on late-season fishing and find out when and where your off-season trip might spawn the best fishing day ever. The type of fish you catch will depend on where and when you go. Alaska.org has some hints on the best Alaska fish species to angle for, depending on when and where you go. Thinking outside the tackle box, such as by forgoing King Salmon in favor of Northern Pike, for example, might get you wading away from the crowds. Choose a fish type and check out the Alaska Department of Fish & Game’s assortment of informational pdfs that offer comprehensive facts on each breed — including where to find them. (Psst: Some information sheets even have range maps). Remember, most personal use and sport fishing requires permits from the Alaska Department of Fish and Game. You can buy your license online. Learn the rules and regulations for fishing in Alaska before you go. You can always take the guesswork out of your fishing experience by letting a guide take you to some favorite spots: Try Salmon Fishing by Raft or Denali Fly-Fishing for some unforgettable Alaska fishing excursions. Of course, if you’re more about the eating, try the Alaska Salmon Bake & Palace Theatre Revue. Less work, more tastiness. Either way, we’d love to help you plan your fish-related excursion when you’re visiting Alaska.